KitchenAid Artisan Mixers from £348.95 with free Glass Bowl (retail £61), Food Processor attachment (£152.10) and Joseph Joseph Index chopping boards (£29.95). If you know anyone in the states or are going to the states and can spare 11kg of space in your baggage then buy one from Amazon USA. Kitchenaid block it from being sold to the UK through Amazon USA though and to have it delivered to somewhere like borderlink which costs about £100+ due to the weight of the kitchenaid. This high delivery cost to the UK knocks off your saving unfortunately. Not a good idea as you have to bug a big ol converter which isn't pretty. this is a uk voltage product so why would need a converter ??????????????? This is a UK product from a UK company! He / She was replaying to comment #1 which recommended people buy the mixer from the states as it's cheaper. Thank you for this insight! Do you know if it works with our 240v? And if the warranty is covered in the UK? Thank you for this insight! Do you know if it works with our 240v? And if … Thank you for this insight! Do you know if it works with our 240v? And if the warranty is covered in the UK? I'm still researching ATM, the info I've posted is as far as I've got. If I am headed to the states or know someone that is I will look at the plug side of things. If you find anything further about getting it working without an inverter that would be great to know! There is this for £17.99 but isn't continuous use. You would lose your warranty when it left the states. Thinking holding out for a clearance like Sainsburys did for the classic at £169.99 may be the best bet. The Kenwood KMix is getting good reviews, better than KitchenAid at the moment. Great British bakeoff has switched to kmix infact! I know Sainsburys has some in stock at half price dotted around which may be of interest to you. You would lose your warranty when it left the … You would lose your warranty when it left the states.http://www.davidlebovitz.com/2009/06/will-a-kitchenaid-from-america-w/Thinking holding out for a clearance like Sainsburys did for the classic at £169.99 may be the best bet. The Kenwood KMix is getting good reviews, better than KitchenAid at the moment. Great British bakeoff has switched to kmix infact!I know Sainsburys has some in stock at half price dotted around which may be of interest to you. agree with escortboy I did quite a bit of research before I got my kmix. If you buy a US model then the warranty is no longer valid in the UK. You can't use it in the UK with the voltage convertor thing. I just messaged kitchenaid and they explained everything plus did some online research myself. although people do buy them from the US and use them here without issue. I've got the kmix and to be honest I'm really happy with it and it does everything I need it to do. If you know someone with costco membership then they sell them cheaper than anywhere else I've seen I think the classic was just over £100 last time I was in there which to be honest was over 4 months ago. 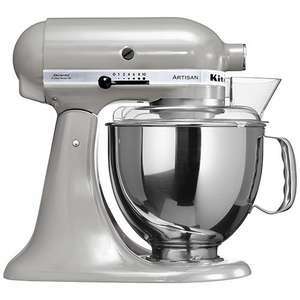 They used to have the artisan a year or so go ago in the larger capacity and it was just over £300 so worth a look if you definitely only want a kitchenaid. Be warned if buying any attachments from the states, the European versions have a collar fitting on the drive spindle (where the attachments fit) and the US ones don't. As I found out to my cost, by the time I'd purchased the converter it would have been cheaper to buy in the UK. Thanks for this op. Was looking for one of these for a birthday present. really like this grey so not sure why it's so much cheaper. Those who are less worried about a perfect cosmetic appearance can get factory seconds in a range of colours direct from kitchenaid on ebay for about £280 inc delivery. Thanks for this op. Was looking for one of these for a birthday present. … Thanks for this op. Was looking for one of these for a birthday present. really like this grey so not sure why it's so much cheaper. Those who are less worried about a perfect cosmetic appearance can get factory seconds in a range of colours direct from kitchenaid on ebay for about £280 inc delivery. Just bought the metallic chrome from Harts and got told it's exclusive to them that's why the price is good. Don't get the Joseph Joseph chopping boards with this one though but all the other goodies by redemption.